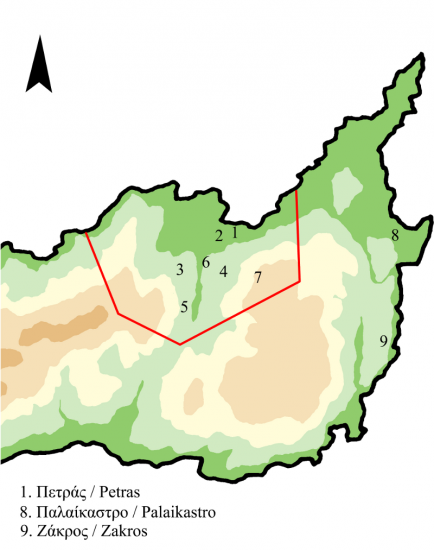 During the Neopalatial period (1600-1450 BC), Petras(1) was the center of an extensive hinterland, which included a cluster of settlements and two important shrines. N. Platon escavated in the 1950’s several large buildings, which he labeled villas or mansions, and suggested that they served local leaders, at Klimataria(2), Achladia(3), Zou(4), and Aghios Georgios(5). The function of these buildings, which present interesting architectural features, and were equipped with storage areas and industrial installations, for the production of wine (Profitis Ilias) or pottery (Zou), was clarified after the excavation of the Petras palace. They were not isolated in the countryside, but constituted the centers of smaller settlements, connected to the palace or depended upon it. The only exception is Klimataria, built at the end of the ancient coastline, which was connected directly to the urban center of Petras. The agricultural and industrial products of these peripheral villas and settlements were transferred to the Petras palace, where they were recorded, stored, consumed or redistributed, or even transported in other areas by sea and traded. 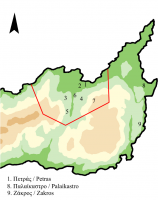 The Petras hinterland included also the sanctuary of Piskokefalo(6) and the peak sanctuary of Prinias(7). *You can see the places on the map below. Click to enlarge.